SCP Waterstops are manufactured from high quality PVC and are specifically developed to seal joints in concrete structures. 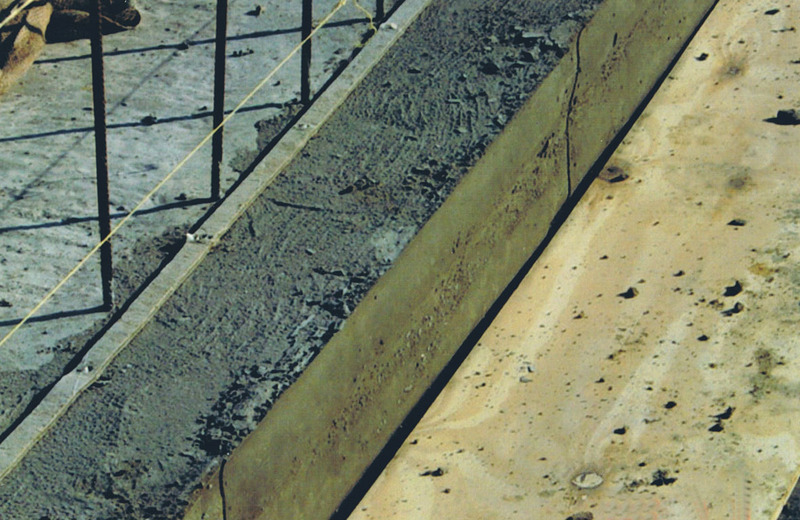 Dual Seal Waterstop is a Bentonite based waterstop which reacts in contact with water by swelling to form a watertight seal in concrete structures. Dual Seal Waterstop has been independently tested up to 30 metre head of water, it has full WRAS approval for use with potable water. Dual Seal Waterstop has been specifically designed to seal construction joints against the ingress or outgress of liquids in water retaining or excluding structures. Dual Seal Waterstop is fixed by nailing to the face of the existing pour prior to placing the next pour. It is installed directly onto scabbled surfaces and will swell into voids up to 12mm deep. Changes of direction and end joints are simply achieved by butting together, no welding or adhesives are required. Dual Seal Waterstop can be applied to green concrete and in damp conditions. 7mm x 25mm - Supplied in 8 metre rolls. Salt Water Grade available for use when salt content exceeds 2000p.p.m. Superstop has been developed to provide a watertight seal in construction joints, and is particularly effective when used in ‘box out’ applications. When water comes into contact with Superstop the bentonite expands to form a pressure seal which has been successfully tested to withstand a 33 metre head of water without leakage. Superstop is fixed either by nailing or adhering into a previously formed 12mm x 25mm void (using a reusable void former), around the perimeter of the box out and must be confined on all four sides. Dual Seal Waterstop can be used as a puddle flange around the pipes. Concrete is then poured into the box out and compacted. Any water passing through hairline cracks between the different surfaces will cause the Bentonite to swell and form a totally watertight seal. Swelltite Hydrophilic Waterstop is manufactured from a neoprene polymer based hydrophilic compound and high water absorbent resins. Swelltite has been specifically designed for use in sealing construction joints between pre-cast concrete units, steel and in-situ concrete. Unlike traditional waterstops Swelltite is centrally placed and bonded flat in the joint prior to making the second pour. Activated by water Swelltite will swell up to 5 times it’s volume and seal the passage of water by exerting pressure across the joint. Swelltite was primarily developed for use to provide a watertight seal between pre-cast concrete units such as concrete pipes and tunnel segments, however it can be installed into a previously formed rebate for use in in-situ concrete. Surfaces must be smooth, dry and free of contamination. The surface must be primed with SCP primer ‘P’ and allowed to dry. Remove the release paper from the Swelltite and press firmly into position on the primed surface. Joints in Swelltite must be butted tightly for continuity. Where concrete is to be placed against Swelltite there must be a minimum of 75mm concrete cover. Uraswell is a polyurethane based sealant which swells in contact with water and forms a permanent waterproof seal. Uraswell is solvent free and non-toxic and is easily applied with a barrel gun, it provides excellent adhesion on many materials including concrete. Uraswell can be used for the sealing of construction joints in concrete and for sealing between concrete prefabricated elements, such as sewage pipes etc. Uraswell is particulary effective in conditions of High Salinity and is applied up to a maximum width of 20mm. Leave to cure for 24 hours before pouring concrete. In order to achieve optimal performance SCP Uraswell should be applied in closed joints. Bentorub consists of bentonite clay and butyl rubber and is used for the sealing of construction joints in concrete. The system is ecological, user friendly and will remain permanently active within the joint for the expected life of the structure. As concrete cures shrinkage will occur, with voids and small cracks appearing in the construction. When in contact with water Bentorub expands and will fill these voids or cracks thereby maintaining a watertight seal of the joint. Supplied in standard and salt water grades. Bentorub is used in construction joints, pipe penetrations, sewer systems, sheet piles, slurry walls etc., and can be used in water treatment plants, underground parking, water reservoirs, swimming pools and all concrete constructions subjected to high water pressures. Bentorub is installed either by creating a groove in the formwork of the first pour, shot firing through the Bento-Cage or glueing with contact adhesive. Bento-Cage is a preformed galvanised steel cage specifically designed to hold Bentorub securely in place during the second concrete pour.